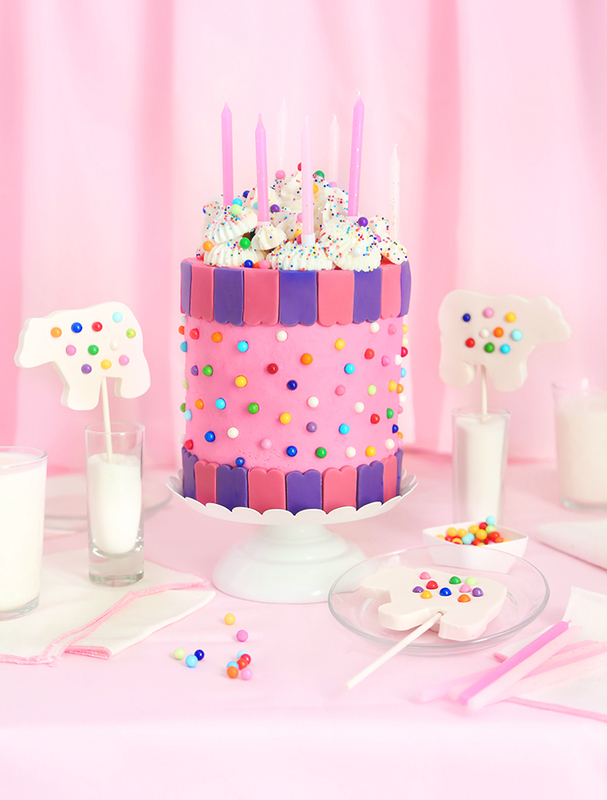 This pink celebration cake is inspired by a nostalgic sweet - Frosted Circus Animal Cookies! It would make a lovely birthday cake, or use it as an edible centerpiece for any happy occasion. I've been seeing all kinds of beautiful Circus Animal Cookie-inspired cakes and treats on the web, and I've been itching to make a version of my own. It's taken a while to find the right inspiration for a cake design, and it wasn't until I purchased a bag of Mother's Circus Animal Cookies, that I found what I was looking for. The bright pink shortbread cookies offer a lot of eye-popping inspiration, but it was their packaging that inspired me most. The top edge of the Mother's Cookies bag has an adorable pink and purple awning (or bunting) across the top edge which looked so cheerful. I decided to give my cake the same design. 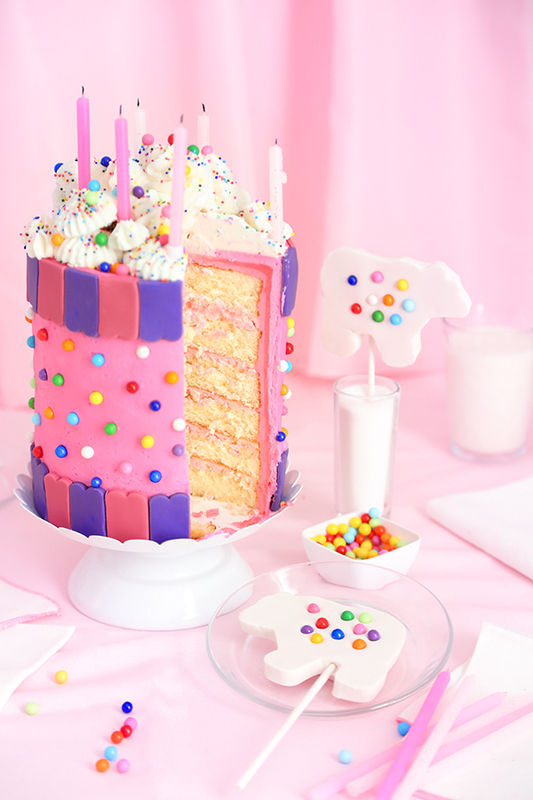 This cake begins with six 6-inch yellow cake layers, and it's filled with silky Swiss meringue buttercream flavored with crushed circus animal cookies. It's covered with more buttercream, and studded with rainbow sugar pearls. You can find similar sugar pearls here, or in the baking aisle at most US craft stores. The bunting design around the top and bottom edges of the cake were stamped out of ready-made rolled fondant using the bottom edge of this tiny house cookie cutter. I made some fun bear-shaped lollipops for cake toppers using gum paste, but at the last minute I decided a pile of sprinkle-covered buttercream kisses and birthday candles looked best. The piped buttercream kisses are so easy to make. Use a piping bag filled with white buttercream and fitted with a large star tip; pipe frosting in 2-inch stars/kisses on a baking sheet and cover with rainbow nonpareils - then freeze. When you're ready to decorate the top of the cake, remove the pan from the freezer and use an offset spatula to transfer the firmed buttercreams to the top of the cake. They look a little bit like meringues, and hold their shape really well even at room temperature! 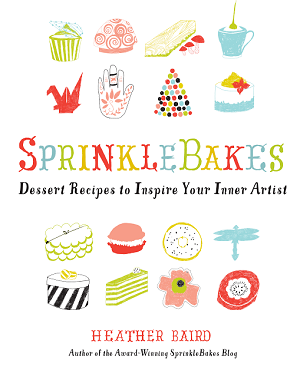 Hellooo sprinkles! This is my kind of party cake! 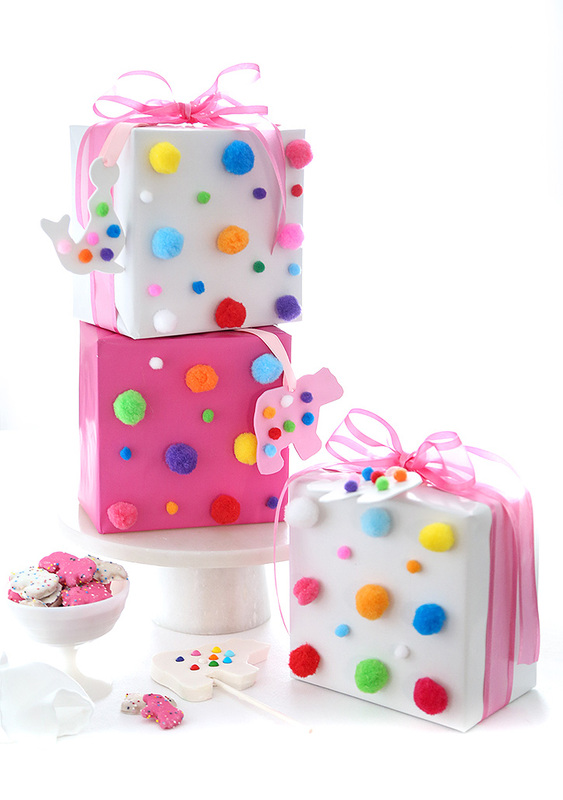 How cute is this Circus Animal Cookie gift wrap? 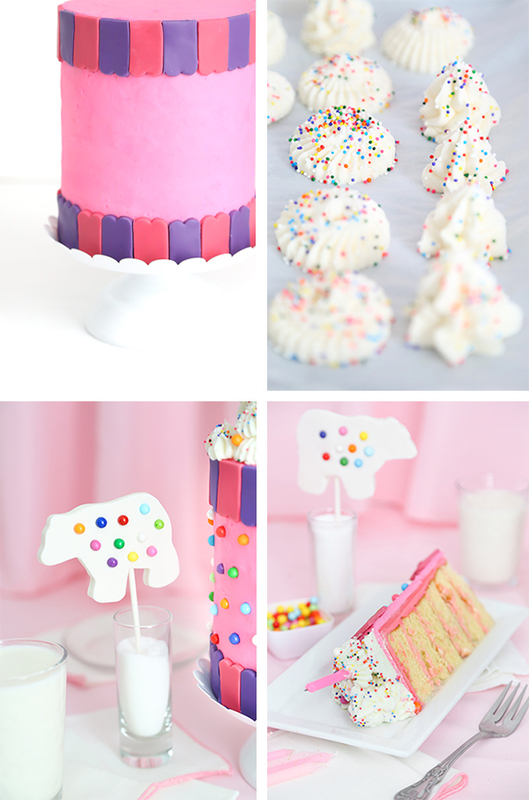 It's something that was directly inspired by the cake in this blog post, and I think it would be so cute if you're planning a Circus Animal Cookie-themed birthday party. Little known fact: I am a gift wrap enthusiast! I love making gifts look special. 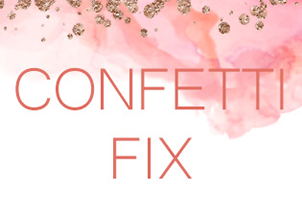 You can find the instructions and templates for this easy wrapping project here on Confetti Fix! The crushed frosted shortbread cookies in the filling give the cake a buttery vanilla sugar cookie flavor. There's few complexities going on here, it's just a nice yellow-vanilla cake with a few soft cookie bites between layers. It's nice, and sooo nostalgic! If you look closely at the picture above, the cut cake reveals that it was frosted 3 times (it looks much like a cross section of tree rings!). I struggled to find the perfect shade of pink, and I finally got it right with the last layer. 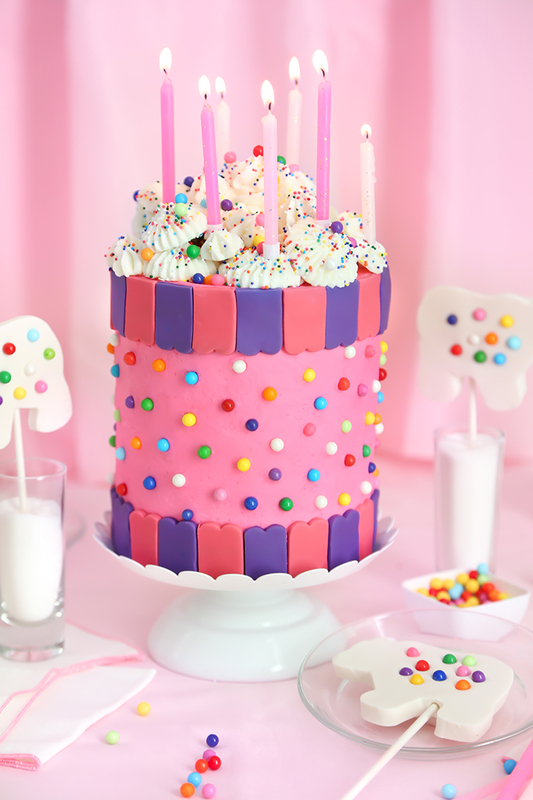 Baker's Rose, along with a drop of Neon Pink gel food color will give you the perfect shade for this cake. One last recommendation. I taste-tested three brands of circus cookies, and Mother's brand had the best flavor, no contest! Nobody is paying me to say that, I'm just recommending it to give this cake the best flavor possible! 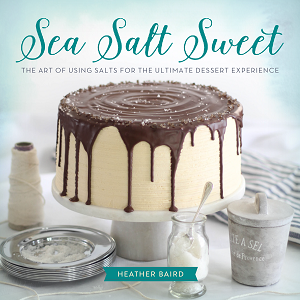 In the bowl of an electric mixer, beat together the sugar, butter, and salt until fluffy. Beat in the oil and vanilla; then the eggs, one at a time, beating until each egg completely disappears before adding the next one. Scrape the sides and bottom of the bowl. In a separate bowl, whisk together the flour, cornstarch, and baking powder. Add 1/3 of this mixture to the mixing bowl, mixing until combined. Beat in half the milk, and then mix in another third of the dry ingredients. Add the remaining milk, and end with the remaining dry ingredients. Scrape the bowl and mix again briefly. Divide the batter between the prepared pans. Bake for approximately 17-20 minutes, or until a toothpick tester inserted in the centers of the cakes comes out clean. Remove them from the oven and place them on a rack to cool for 5 minutes. 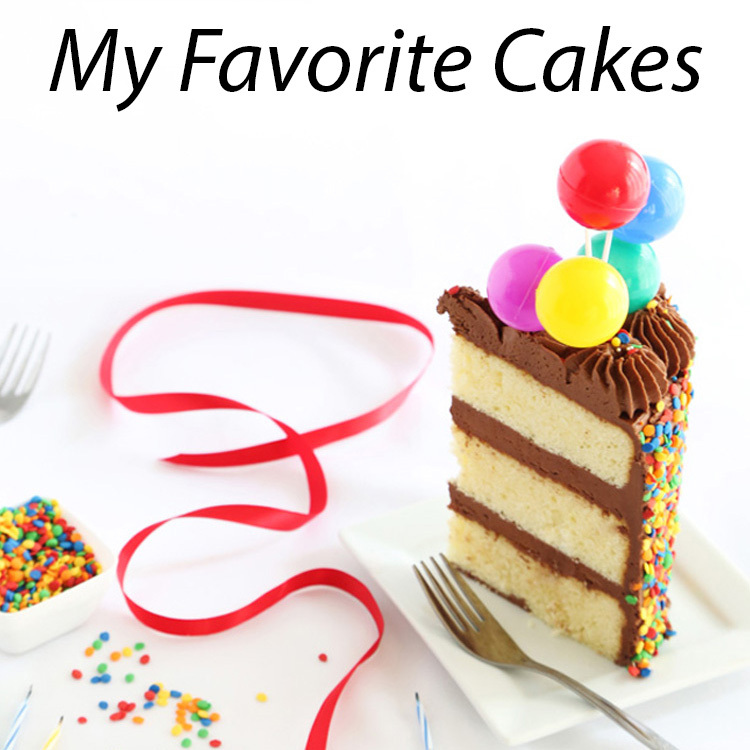 Turn cakes out onto wire racks to cool completely. Level with a serrated knife or cake leveler, if needed. Make the frosting: Set a saucepan filled one-third full of water over medium-high heat and bring to a simmer. Whisk together the egg whites, sugar, and salt in a large heatproof bowl (I suggest a stainless steel bowl). Set over the simmering water and whisk until the mixture is hot to the touch and the sugar has dissolved (120-140 degrees on a candy thermometer, to be sure). Transfer the mixture to the bowl of a stand mixer fitted with the whisk attachment. Beat on low speed for 2 minutes. Increase to medium-high until stiff peaks are formed. Continue beating at medium-high speed until the mixture is fluffy and has cooled (the mixing bowl should feel cool to the touch). Turn the mixer off and switch from the whisk attachment to the paddle. Turn the mixer on medium-low and add the butter, a few cubes at a time, beating until well incorporated before the next addition. Add the vanilla extract. Remove one third of the frosting to a separate bowl and combine with the crushed animal cookies. Tint the remaining frosting with the baker’s rose food color and a tiny drop of neon pink gel food color. Beat until the frosting is thick and completely smooth. Assemble the cake: Place a cake layer on a cake board. Fill with animal cookie frosting. Repeat with remaining 4 layers, placing a final unfrosted layer on top. Dowel the cake through the center so the layers stay put. (I used a cardboard cake dowel). 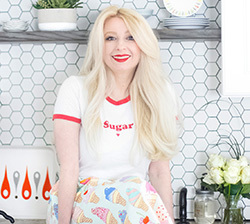 Cover the cake with a crumb coat of pink buttercream; refrigerate until firm. While you wait for the cake to firm, make the pink and purple fondant bunting. Roll each fondant color to 1/8-inch thickness on a lightly confectioners’ sugar-dusted work surface. Use a scalloped fondant cutter to cut lengths of each color. Cut between each second scallop and line up the pieces in alternating colors. Cover the fondant pieces with a piece of plastic wrap so they don’t dry out. Cover the cake with a second smooth layer of the pink buttercream and line up the scalloped fondant segments on the top and bottom edges of the cake. Press the rainbow sugar pearls into the frosting between the top and bottom scallops. Refrigerate the cake until firm. Meanwhile, make the batch of American buttercream and transfer it to a piping bag with a large open star tip. Pipe buttercream onto a baking sheet in 2-inch stars (or kisses) and immediately cover with rainbow nonpareils. Freeze until solid, about 30 minutes. Remove the cake from the refrigerator; also remove the frosting stars. Use an offset spatula to transfer the frozen buttercreams to the top of the cake. Pile them up haphazardly or in a style that’s most pleasing to you. 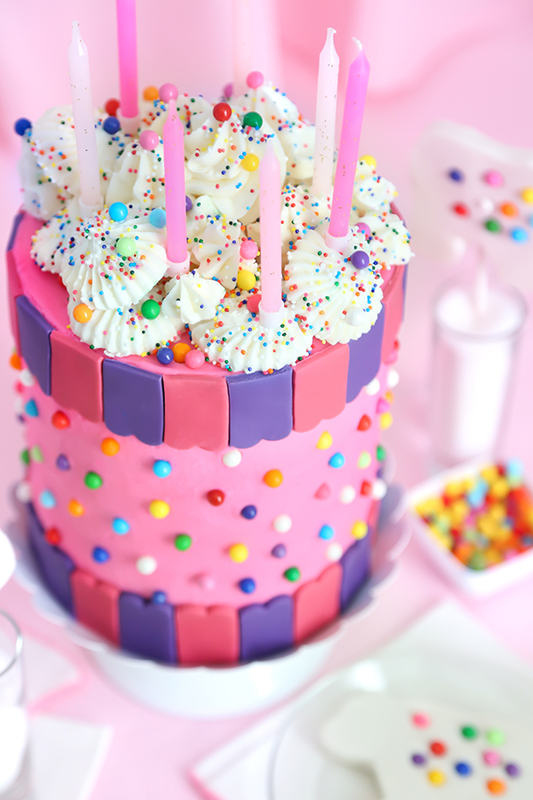 Add a few rainbow sugar pearls and birthday candles to the top of the cake. Allow the cake to come to room temperature before serving. Oh, and Mother's is the best circus animal cookie...I totally agree. This is so fun and pretty! I have always loved circus animal cookies :) We still buy them at Christmas time and share.